When traveling to Cuba you first have to realize how big of a country Cuba is. Don’t try and pack in too many cities into one trip to Cuba, try and focus on visiting the best places in Cuba. Cuba is 780 miles long and 119 miles wide at the widest point, and if you take a Cuba road trip you will learn very fast that driving in Cuba takes a long time to get from one city to the other. If you have one week in Cuba or possibly even 10 days in Cuba here are the best places in Cuba to visit. Hannah car shopping in Havana for the perfect old car for our Havana city tour. Most trips to Cuba start and end in Cuba’s capital city Havana. Havana is a great place to start a trip to Cuba and is one of the best places in Cuba to visit. As soon as you land at José Martí International Airport you’ll start to see the old classic cars. Our taxi from the airport to Old Havana was a vintage 1950’s America car. Stay with a local family in a casa particular or Havana Hotel in Old Havana, as this is the best part of town for all the action and all the things to do in Havana. 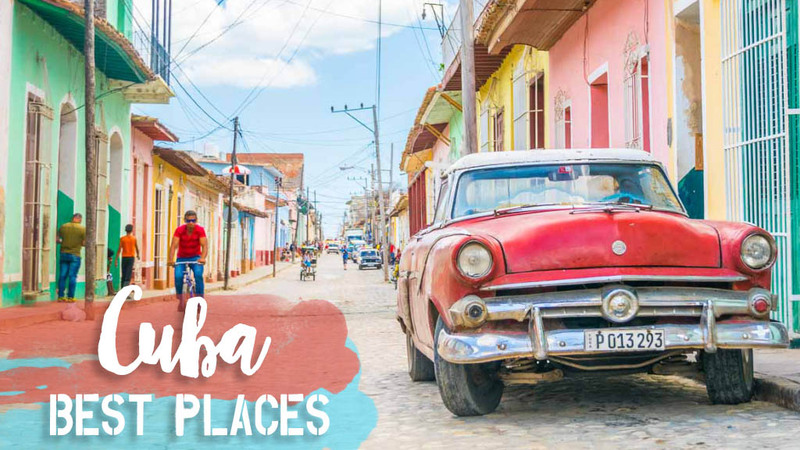 You could easily spend hours walking around Havana taking pictures and chatting with friendly locals but make sure to take a Havana tour in an old classic car for roughly $35 an hour. If you stay outside of Old Havana jump in a collective taxis with the locals for 10 CUP, not only is it cheaper but a local experience too. We suggest staying in the Central Havana check out our where to stay in Havana guide to explain the different areas of the city. If you want to prearrange your accommodation there are over 300 listings on Airbnb, we booked our first 2 nights on Airbnb. We didn’t want to arrive and be scrambling to find somewhere to stay. Click here for $40 off your Airbnb booking. If you’re a photographer wanting to go to the best places in Cuba you can’t miss Trinidad Cuba, look at it! Trinidad is easily reached from Havana either by bus or rental car. We rented a car in Cuba and went on a road trip. Trinidad is a Cuba’s best-preserved colonial town and the old quarter of Trinidad is a UNESCO World Heritage site. There are a ton of things to do in Trinidad Cuba let me show you why Trinidad is one of the best places in Cuba. Hannah being a tour guide in one of the best places in Cuba, Trinidad! Trinidad has something for everyone. From amazing beaches at Playa Ancon only fifteen minutes away, hiking in Topes de Collantes, visit El Nicho waterfalls, horseback riding, go late night clubbing in a cave at Disco Ayala, drink mojitos in Plaza Mayor, and so many more things to do in Trinidad. You should spend 2-3 nights in Trinidad, there are several Trinidad hotels and casa’s right in old Trinidad to base yourself. Trinidad was not just one of the best places in Cuba to visit but our favorite. No other city in Cuba is as photogenic as Trinidad Cuba. Hannah just chilling on the beach in Varadero, one of her favorite things to do. Are you a beach lover and looking for the best places in Cuba to visit with white sand? Look no further than Varadero. Varadero has more than 12 miles/20 kilometers of white sandy beaches on the Caribbean. Varadero is a popular Caribbean resort town but there are still tons of casa particulares available. We stayed with a family 1 block from the beach for $25 a night. We felt like we had all 20km of white sandy beaches to ourselves in Varadero, one of the best places in Cuba! There are several beach bars in Varadero that have beds set up free for their customers and serve up tasty drinks & beers for only $1-2. Tons of ocean activities from diving, fishing, snorkeling, kayaking, and much more. Varadero is one the best places in Cuba to visit at the end of your trip to Cuba as you make your way back to Havana. Hannah ready to go exploring the tobacco fields by a horse in Vinales Cuba. One of the best places in Cuba to visit when looking for authentic Cuban cigars is Viñales. Viñales is 2.5-3 hours away from Havana, but unfortunately, you’ll have to take the same road there & back. I’d suggest making the trip to Viñales if you have at least 10 days in Cuba Viñales has gorgeous landscapes with tobacco fields and barns making it a picturesque Cuban scene. Tobacco drying barn in the tobacco fields in Cuba. Spend 1-2 days exploring the Viñales Valley, rent bikes/mopeds and explore it on or better yet by horseback or bull. Get a tour of a local tobacco farm, learn how to roll your own Cuban cigars. Buy some original Cuban cigars right from the source. Viñales Valley was recognized as a UNESCO world heritage site in 1999. One of the best places in Cuba we had to ourselves! Only an hour away from Havana is one of the best beaches in Cuba. Thankfully not many tourists know about Playa Jibacoa yet. The only way to get to Playa Jibacoa is by car, no public buses. If you are driving in Cuba on a road trip looking for the best places in Cuba to visit you should definitely put Playa Jibacoa on your route. We think this picture clearly shows why Playa Jibacoa is one of the best places in Cuba, it’s straight up gorgeous. Have you been to Cuba? What do you think are the best places in Cuba to visit? Leave your suggestions below in the comments. We rented our car right at the airport, but we REALLY REALLY lucked out on that. It wasn’t a major chain and sorry I don’t’ remember the name. If you want to rent a car make sure to do it well in advance online. Love all your posts on Cuba! My husband and i are traveling there in a couple weeks and we are interested in visiting Havana, Trinidad, a beach town and horse back riding!! We have 6 days so we will take your advise on not cramming it with too many spots. Hope you guys have an amazing time in Cuba. I found his business card! It was Casa Orlando, here is the tripadvisor link http://www.anrdoezrs.net/links/7584873/type/dlg/https://www.tripadvisor.com.sg/Hotel_Review-g147275-d7705648-Reviews-Casa_Orlando-Varadero_Matanzas_Province_Cuba.html Their email is [email protected] they have a child that lives outside of Cuba that will respond to you. They then call the parents in Cuba to reserve your room, since the parents don’t have internet at their homes. We booked our casa in person, we just walked up to houses with the sign on the door meaning they had rooms for rent. We looked at a few before we picked ours. I think it was $30 or $35 a night, but was a few minute walk to the beach. Thanks for the mention in the article. Look forward to traveling there within the next few years. We had an amazing time in Cuba, biggest mistake was only spending 10 days in Cuba. Next time we travel to Cuba it will be for at least a month. Safe travels. We’re heading to Cuba next year for 16 Days, starting and ending in Havana. What would your suggest as a natural progression of tours around the country to all the locations you just mentioned? We didn’t do any tours in Cuba, we rented a car and self-drove most of it. You can take the bus or hire a taxi. For example, a taxi from Havana to Vinales was only $70. I’d do a mix of the bus and private taxi’s. Safe travels. Thank you! I am going there in December! Can’t wait to check out all of those places! Great tips ! So jealous you’re going to Cuba! Let us know if you have any other Cuba travel questions. Safe travels! Awesome the reason this post caught my eye is my first car was a 1954 Ford Crestline just like the one in the title post. I want to get over to Cuba soon myself. But great story and photography. Wonderful article very well written. Also amazing photography skills. Thanks so much. Cuba is so photogenic you could get lost for hours with your camera! Hi! Awesome post, I will be getting over to Cuba next year and this is perfect! If at all possible, I’d love to share a link to this? 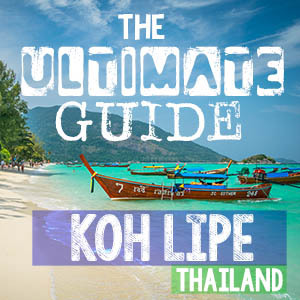 We share quality posts through an online travel mag so use an image from the post and a short excerpt and it goes up on the homepage, check it out and let me know what you think! Some great shots here. Wonder how Cuba is faring with Hurricane Matthew? Thanks Janet! Not sure how Cuba weathered the storm. We hope to get back to Cuba soon! Is Cuba on your radar?